In order to find an alternative for commercial inulinase, a strain XL01 identified as Penicillium sp. was screened for inulinase production. The broth after cultivated was centrifuged, filtered, and used as crude enzyme for the following saccharification. At pH 5.0 and 50 °C, the crude enzyme released 84.9 g/L fructose and 20.7 g/L glucose from 120 g/L inulin in 72 h. In addition, simultaneous saccharification and fermentation of chicory flour for d-lactic acid production was carried out using the self-produced crude inulinase and Lactobacillus bulgaricus CGMCC 1.6970. 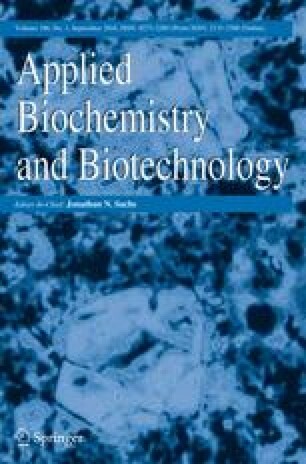 A high d-lactic acid titer and productivity of 122.0 g/L and 1.69 g/(L h) was achieved from 120 g/L chicory flour in 72 h. The simplicity for inulinase production and the high efficiency for d-lactic acid fermentation provide a perspective and profitable industrial biotechnology for utilization of the inulin-rich biomass. Zhaojuan Zheng and Qianqian Xu contributed equally to this work. This study was supported by the National Natural Science Foundation of China (51776099, 31300487), the Key Research and Development Program of Jiangsu Province of China (BF2015007). The authors are also grateful to the Priority Academic Program Development of Jiangsu Higher Education Institutions (PAPD). Shi, N., Mao, W., He, X., Chi, Z., Chi, Z., & Liu, G. (2017). Co-expression of exo-inulinase and endo-inulinase genes in the oleaginous yeast Yarrowia lipolytica for efficient single cell oil production from inulin. Applied Biochemistry and Biotechnology. https://doi.org/10.1007/s12010-017-2659-1.